FREMONT, CA--(Marketwire - May 14, 2008) - There are now less than 1000 days projected until IPv4 exhaustion. You need an IPv6 plan. Hurricane Electric can provide you with native IPv6. IPv6 is the next generation Internet protocol that is designated to replace IPv4. Who needs to know about IPv6? If you are a system administrator or network engineer, you need to understand how to deploy and administer IPv6 on your existing equipment or figure out what hardware or software you need to support IPv6. If you are a technical manager you need to ensure that your staff gains operational experience with IPv6 in order to support your organization and customers. If you are in sales or marketing and your business depends on the Internet then you need to develop competitive strategies for how you will present your IPv6 capability when this becomes a market driver. If you are in executive management (a CEO, COO, CFO, or CIO) or are an investor in an Internet company, then you need to know about IPv6 from the risk management perspective of ensuring your organization has an IPv6 plan. If you are an end user, you just need to look for IPv6 support when selecting network services, software, or hardware. It is everybody else's job to make sure you don't have to worry about the technical details of IPv6. Aside from the technical features of IPv6, why does anybody need to deploy IPv6? IPv6 is being deployed to get unique globally routable IP addresses, for two reasons: IPv4 addresses are running out and there are networks with more devices than can be currently assigned unique globally routable addresses under IPv4. When will the IPv4 address pool be exhausted? The date the IANA is projected to run out of addresses to allocate to Regional Internet Registries (ARIN, RIPE, APNIC, LACNIC, AFRINIC) is around January 31, 2011. The date the RIRs are projected to run out of addresses to allocate to ISPs is around November 28, 2011. These projections assume there won't be a land rush to get IPs once end user organizations realize it is their last chance to get their own routable IPv4 address space, and that there won't be hoarding or speculation. Why does getting IP addresses matter? Ask yourself how relevant getting any more addresses is to the various types of services your company provides. If your organization already has all the IP addresses it will need in the next 10 years then aside from competitive issues (your competitors supporting IPv6 and saying you don't support IPv6), you may be able to ignore this warning. Do you expect to deploy a significant number of servers in the future that need to be reachable from the Internet at large? Do you sell a service, software, or hardware which requires customers to be able to get unique globally routable address space? Do you assign address space to customers or end users? IPv6 provides the ability to get globally routable addresses in the future after the IPv4 address pool is exhausted. If you depend on your ISP to take care of this for you, then make sure they either already provide native IPv6 or have an IPv6 plan. Network service providers, such as Hurricane Electric, must be the first to deploy so that network users can get native IPv6 and begin the task of learning, experimenting, and testing well in advance of their need to provide production services. Is IPv6 connectivity the same as IPv4 connectivity? Not today, and potentially not for many years. IPv6 has a varied rate of deployment by various organizations; this means some backbones have it deployed natively in their core alongside IPv4 everywhere (like Hurricane), others have it deployed on a limited number of routers as a "tunnel net," and some have not deployed it at all. Because IPv6 deployment is different than IPv4, the backbone network topology and the connections between IPv6 backbones is different than IPv4. Any specific path via IPv6 may be faster (more direct) than IPv4, the same as IPv4, or in some cases slower than IPv4. This should be expected. Because IPv6 is still in early deployment stages, there are less servers running IPv6 than IPv4, and most of the IPv6 servers are pilot deployments running a subset of services. This also should be expected. I'm from a large organization, projections are all well and good, give me some official dates. Why create an IPv6 plan when the OMB date turned out to be a soft date and the IPv4 exhaustion dates are just projections? The value of setting deadlines and creating timelines is to help people within your organization plan accordingly. Be sure to take into account your organization's capital expenditure cycle for core equipment such as routers and firewalls. Assets such as routers and firewalls are typically replaced every 3 to 7 years. If replacing legacy equipment with new equipment that supports IPv6 affects your capital expenditure budget then you need to start planning now, so that IPv6 capability is part of your natural replacement cycle instead of an extraordinary capital expenditure made at the last minute in crisis mode. In the not so distant future, Sarbanes-Oxley and SAS 70 auditors will likely require disclosure of IPv4 exhaustion as a business continuity risk, as well as the presence or lack of an IPv6 plan. Having an IPv6 plan ensures you are well prepared. Do we want to still be in business in 3 years? Since the answer is yes, this provides the clear motivation to deploy native IPv6. Further, since Hurricane Electric views their deployment of native IPv6 as a precursor to the ability of their customers to provide production services over IPv6, Hurricane Electric started early and in earnest. IPv6 planning for Hurricane Electric was a matter of taking IPv6 into account when making purchasing decisions and implementing projects. Hurricane Electric viewed IPv6 from a risk management perspective that it didn't cost much and potentially gained the company a competitive edge if IPv6 was important, whereas if Hurricane Electric didn't do it they were risking the business for the sake of avoiding a little thinking. In early 2007 Hurricane Electric completed a network wide core router and backbone circuit upgrade. As part of this process Hurricane Electric moved its IPv6 network in its core and now runs dual stack wirespeed IPv6 and IPv4 in all locations. Native IPv6 is available on the same port as IPv4 at no additional charge. The apache, ssh/sftp, and pop3/imap portions have been validated. For networks and servers not connected to Hurricane Electric's network and that don't have easy access to native IPv6, Hurricane offers a free tunnel broker service that enables you to reach the IPv6 Internet by tunneling over existing IPv4 connections from your IPv6 enabled host or router to one of Hurricane Electric's IPv6 routers. Hurricane Electric's tunnel service is oriented towards developers and experimenters that want a stable tunnel platform. Hurricane Electric took a first pass at developing some metrics for global IPv6 deployment. Some of the items measured are: the number of networks running IPv6, the number of IPv6 prefixes with working reverse DNS, the relative performance of IPv6 vs IPv4 as measured by pinging nameservers with both IPv6 and IPv4 connectivity, and the number of Alexa top 500 websites that have added AAAA records so far. Forward this information to other people that need to be aware of this. Forward this information to people at your company such as your staff, boss, or whoever manages your network or servers for you. Forward this information to your vendors that provide you with Internet related services, software, or hardware. What should you do in the upcoming months? If you are a network engineer or system administrator then learn about how to configure your routers and servers for IPv6 and then try setting up a server with basic IPv6 connectivity so that you can ping it and access it via HTTP and ssh. If you are a CIO or IT manager, talk with your engineers and start reading about IPv6 so that you can make a checklist and an IPv6 plan appropriate for your organization. If you are an end user, make sure your organization has an IPv6 plan. If it doesn't, talk to whoever is in charge of your network and/or servers. Once you have an IPv6 plan, and confidence about how you will proceed, let everybody know your plans: employees, customers, vendors, and investors. There are now projected to be less than 1000 days until IPv4 exhaustion, assuming there is no last minute rush, hoarding, or speculation. Adjacencies means networks that run BGP that a network connects to; i.e. customers or peers. Hurricane Electric also now announces the largest number of IPv6 customer prefixes (240) out of any IPv6 network in the world. Hurricane Electric (AS6939) runs dual stack IPv6 and IPv4 on all core routers in Europe and the US. If you are not running native IPv6 yet because your transit provider doesn't offer native IPv6 yet, Hurricane Electric may be able to provide service to you. 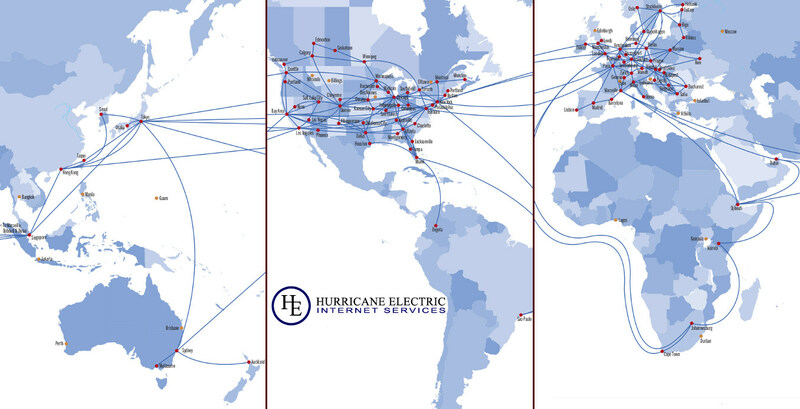 To help companies get connected to the IPv6 Internet, Hurricane Electric is offering an IP transit promotion to networks that run BGP of $5/Mbps for a full 1000 Mbps Gigabit Ethernet Internet connection.